Direct from the Grower to You! Jeanne Weller answering a question. 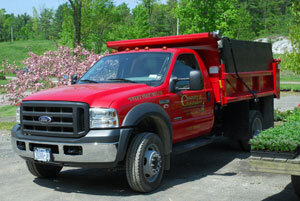 The Country Caretaker started as a lawn maintenance service in 1983. Dave and Jeanne Weller and our youngest daughter, Marcey, mowed lawns while Elise, our oldest daughter, did the office work. 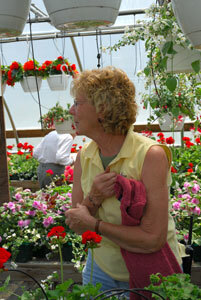 In the fall of 1990 we expanded the business with the purchase of two greenhouses. 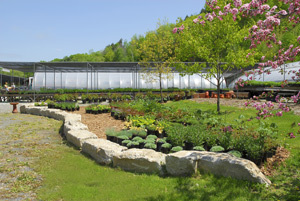 Over the years we have continued to add on; we now have eleven greenhouses. In the past few years we have expanded into landscape products like decorative gravel and mulches, sweet peet, and gift items as we have seen a need from our customers. We offer delivery of top soil and decorative gravel if you need it. We have started to focus on the special needs of professional landscapers as well as homeowners. Dave’s and Jeanne’s mothers helping out. 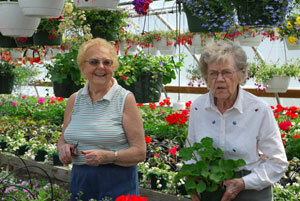 With the help of Dave’s and Jeanne’s parents and daughters, and our terrific staff, we grow all the annuals, vegetable plants, herbs, hanging baskets and perennials here in our eleven greenhouses. Although we’re open from April to November, everyone is busy from January to March seeding and transplanting all those plants we have ready for you in May. 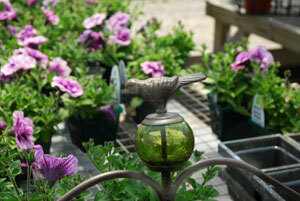 We have a changing variety of unique lawn ornaments and planters. All of us love having you shop here. 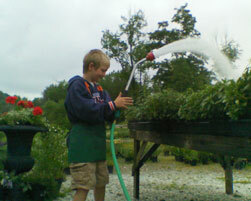 It’s fun for us and we enjoy helping with your garden plans. We take pride in the quality of our products and friendly service. We look forward to seeing you.